Last summer, I got behind in the garden and let some of the radishes go to seed. I was okay with that because the bees loved those flowers and I just let them be for the bees (yes, I know that’s an awful phrasing, but I couldn’t help it). So, doing what plants inevitably do after pollination, they produced seed pods. They looked so interesting, but I didn’t know what you could do with them or if they were edible. After they were hard, dried out, and nasty, and it was too late, I was paging through The Joy of Pickling by Linda Ziedrich (no affiliation with Amazon) to see if what else I could do with daikon radish, and discovered a radish pod pickle which supposedly dates from 1824. 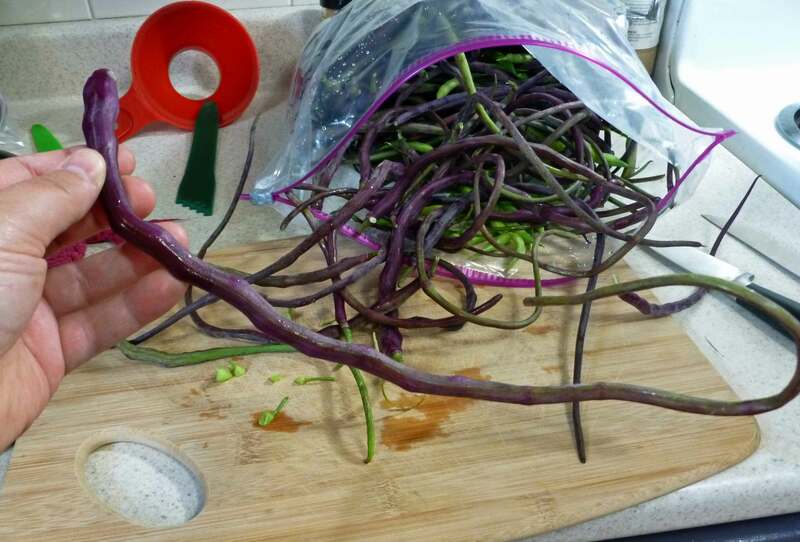 When I was pouring over seed catalogs to plan for spring in January, I found this purple Dragontail Radish (no affiliation with Burpee) that you grow just for the pod. It was purple, and I was already curious about it. What was I supposed to do? Of course I ordered some seeds. 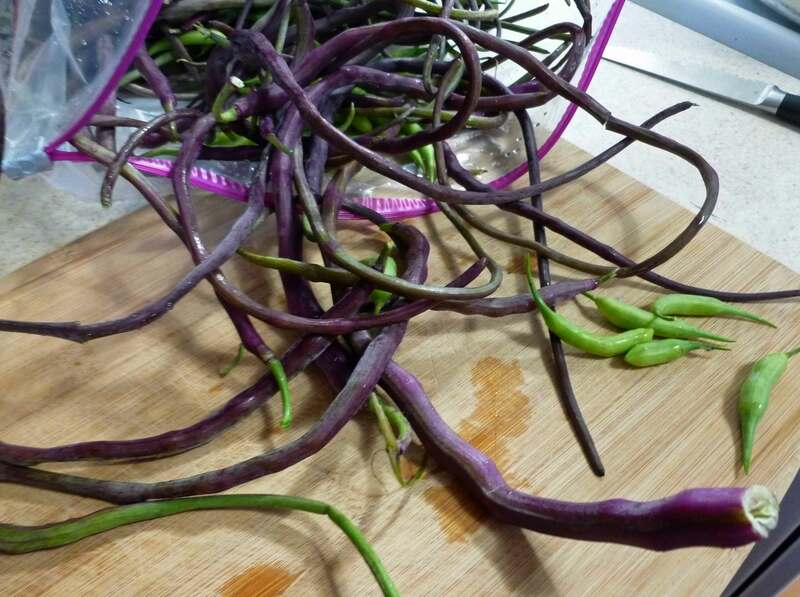 And I got purple radish pods ranging from 6 to 18 inches long. And then of course, I flaked on harvesting some of the regular radishes again, so I had a bunch of very pretty little green seed pods about 2 inches long. I modified the recipe in The Joy of Pickling by Linda Ziedrich to make it a fridge pickle for quick eating and added some whole coriander seed to give it a lemony taste. They are lovely. 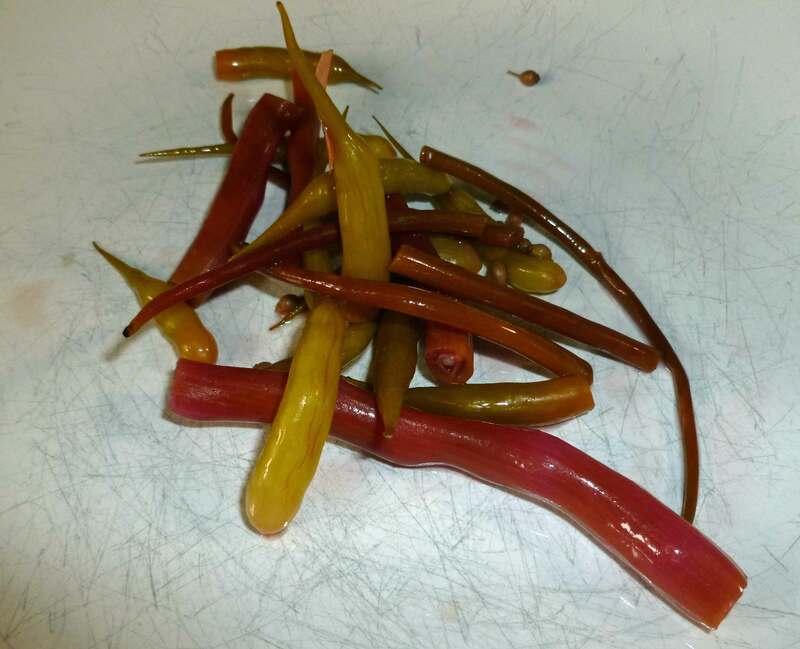 If you can’t find radish pods and want to give this recipe a go, I’d try it with sliced radishes as well, the flavor profile will be the same. 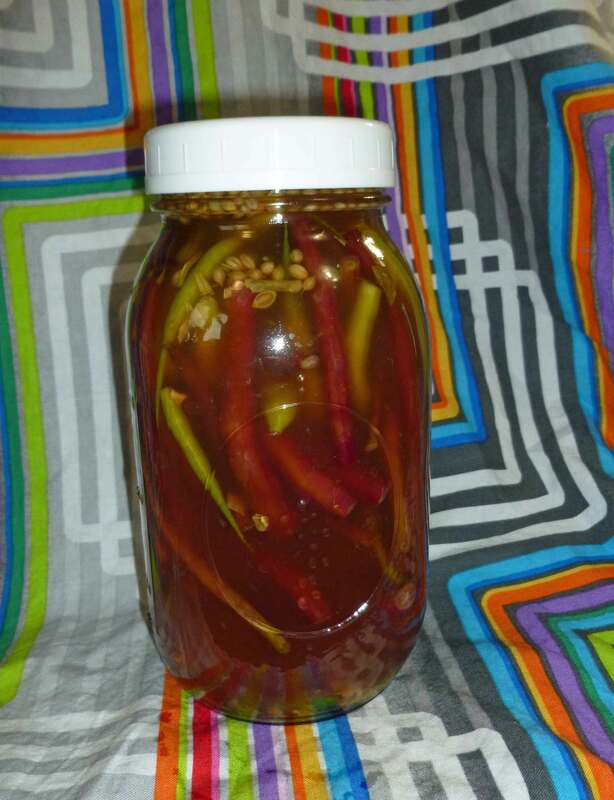 Place radish seed pods, chili peppers, garlic or garlic scapes, tarragon, and coriander seed in quart jar. Place apple cider vinegar, water, and salt in a small sauce pan and bring to a boil. Pour hot apple cider vinegar mixture into jar to covering radish pods. Place lid on jar, cool to room temperature and place in the refrigerator. You can eat them the next day, but for the full flavor to steep in it might take a day or two. Wow! Looks so pretty! I hit upon your blog when searching for Dragon tail radish. Burpees’ is currently out of seeds. Would you be willing to do a SASE or trade? I see some stores carry rat’s tail radish, but these look prettier. Thanks. I don’t have any of the original Burpee seed left, but I saved some of the seeds from pods. The only thing is, I grew other radishes too, so I don’t know if these seeds will be true or if they have been crossed with the other radishes. If you still want to try them, let me know and I’ll send you some.